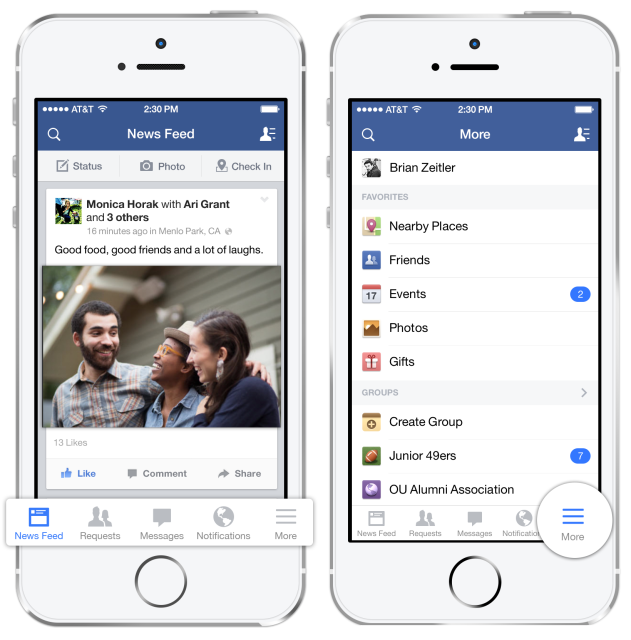 Facebook is trying to take advantage of the new iOS 7 by announcing a new version of its iOS app specially designed for the new OS. Comparing with the Facebook for iOS version 6.5, this time the app perceives significant redesign including a new menu at the bottom of the app which makes it handy to get around. The entire redesigned structure is based on the features related to iOS 7. Thus, switching from News Feed to your friend requests, Messages or Notifications has become easier with the menu bar at the bottom. The new version of Facebook for iOS has included a more tab option that enables you to access your Timeline, groups, events and lot more. However, the redesigned app is currently available for iPhone users only and iPad users will have to wait for a little linger. You may download the updated version of the Facebook app for iOS from the Apple App Store.